I take yoga classes and, at the beginning of each class, our guide tells us to clear our minds and set our intention for today’s practice. “This is your practice; this is your journey based on the goals you set,” she says. Throughout the exercise, we get in touch with our breath, clear our minds and stretch into muscles we didn’t even know we had. We balance and sway and sometimes fall over. But, as our instructor reminds us, we always have the opportunity to take a deep breath, regain our focus and return to being mindful of our intent. When it comes to creating our marketing and PR strategies and branding campaigns, we as legal marketers need to slow down and get more focused on the goal and the intent. All too often, too many other factors cloud our decision-making, such as budgets, personal agendas, fear of failure and a whole lot of reactive responses. For us to be effective at our jobs, we have to try to minimize the pressures that detract from our concentration and instead become more focused on what produces good legal marketing. 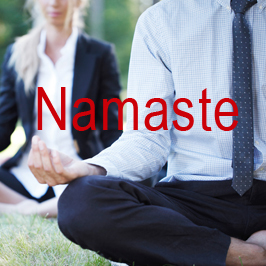 Just as my yoga instructor helps me regain my balance in class, I’m going to use this article to help you as legal marketers regain your focus in the office. Your law firm communication strategies are way too important to be based on which attorneys complain and demand the loudest. In most cases, what they want has zero value for the firm’s market position, growth, brand strategy and business development. When we give in to their negativity, we end up producing a lot of “so what, who cares” information and tools, which just serve to pollute the internet with more noise. You also won’t see the returns that your attorneys are likely to expect. In the end, running your marketing initiative by responding to attorney knee-jerk reactions is guaranteed to put you in a Downward Dog-like spiral. Yoga is about exploring, connecting and focusing. In marketing, we call that brainstorming and strategic planning. The problem with most law firm brainstorming and planning sessions is … everything. In most cases, law firm marketing brainstorming sessions are conducted in non-creative environments with cellphones in hand and a mindset of “How long will this take? I have another meeting.” Imagine if we were able to take the meeting out of the conference room, turn off the noise, clear our minds, set our intention and breathe through the process. Imagine how much clearer the journey would be and how much more creative the results that would come out of the session. When people tell us to take a deep breath to calm down, there is a good reason for it. It feels great, and it will center you and bring things back into focus. Find your ujjayi breath, and let the sound eliminate the negative energy, allowing you to focus on the goal at hand. In yoga, we stretch ourselves into poses that open up our breathing and blood flow, giving us a greater awareness of our thoughts and actions. Imagine where your marketing initiative would go if you stretched your mind by asking “What if” in considering initiatives and strategies you might not have considered before. Imagine saying “yes” to ideas that you thought the firm would never entertain. In yoga, we contort our bodies into shapes that seem unconceivable, as we trust our gurus and accomplish what we thought was impossible. In legal marketing, stretch yourself beyond what you perceive to be concrete parameters. Find yourself in asanas, create your mantra and begin to expand your thoughts out of the legal box you work in. I’m sure you think I’m crazy by suggesting this spiritual, touchy-feely kind of practice in the workplace. But our goal is to succeed, and to succeed is to try new things, so join me in savasana as you focus back on your intent. With your goals in mind, look back at your journey and the ideas that came out, say yes to them, and begin to find ways to bring them to life. By applying the principles of yoga to legal marketing, you can unlock creative and innovative ideas that will bring you and your firm greater results in your brand awareness and marketing and communication initiatives. Now go out and disrupt the status quo in your firm, and see if you can bring some clarity and creativity to your next marketing planning session. Want to discuss more how you can stretch yourself out of the bounds of traditional legal marketing? Contact me, Terry M. Isner, at tisner@jaffepr.com. CEO/Owner, Marketing & Branding - Brains behind several high-profile award winning mar-com and PR campaigns. Artist/painter. Emotional Marketing: Trend or the New Norm?